Join architectural practice and Dennistoun Community Council associate member Dress for the Weather for ‘Field Trips’ – a walk and design workshop that asks participants to record and study the city in different ways. 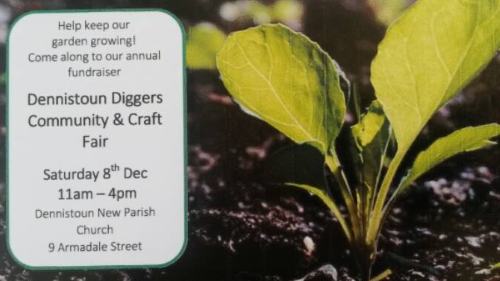 Join the Dennistoun Diggers for the annual Community and Craft Fair from 11am until 4pm on Saturday 8th December 2018 at the Dennistoun New Parish Church, 9 Armadale Street, G31 2UU. Glasgow City Council is holding an inquiry into food poverty and inequality across the city and is seeking evidence and views on this important subject. The Council is aware increasing numbers of people in Glasgow are experiencing difficulties – physically and economically – accessing sufficient, safe and nutritious food. It also knows of a wide range of organisations and charities are responding to those experiencing acute food insecurity – including an established community food sector. It wishes to work with these partners and organisations across Glasgow to ensure the city is operating these responses and services as effectively as possible. The Dennistoun Diggers Community and Craft Fair is back for 2017 on Saturday 9th December from 11am – 4pm at the Dennistoun New Parish Church hall. Dennistoun Community Council will host a general election hustings for the Glasgow North East constituency on Friday 2nd June 2017 in the Large Church Hall, Everlasting Arms Ministry, 12 Whitehill Street, Dennistoun, Glasgow, G31 2LH. Doors open 7pm for a 7:15pm start, to be concluded by 8:45pm. On Sunday 28th February 2016 Glasgow Allotments Forum and Glasgow Local Food Network will host this year’s Glasgow Potato Day following on from previous successful events in 2013, 2014 and 2015. 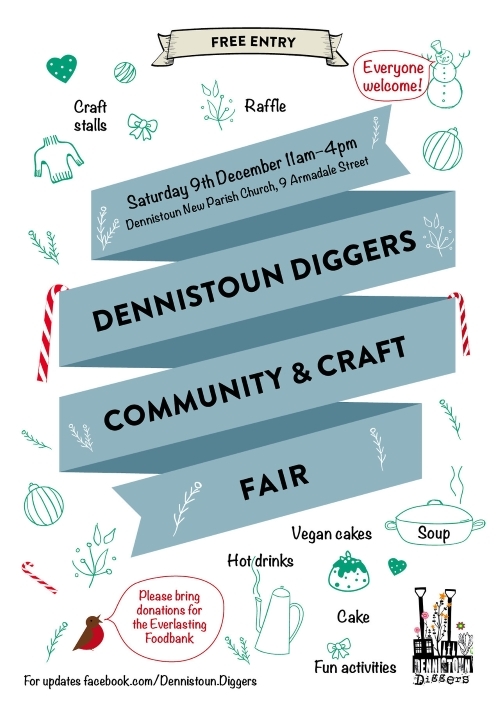 The 2015 Dennistoun Community Day and Craft Fair, hosted by Dennistoun Diggers, takes place on Saturday 5th December, from 11:00 am until 4:00 pm, at the New Parish Church on Armadale Street, G31 2UU. Free Entry! This weekend, Wasps Artists’ Studios on Hanson Street are opening their doors to the public. Get along meet artists and get a peek into the world of an artist in their studio. Part One in a series of food conversations in Dennistoun, hosted by Dennistoun Diggers. Featuring speakers from Oxfam Scotland, Poverty Alliance and the Everlasting Foodbank on Monday 9th March from 7pm until 8:30pm at Redmond’s, 304 Duke St, G31 1RY. Glasgow Youth Film Festival (6th – 8th February 2015) is back for its seventh year! The only film festival in Europe completely curated by 15-18 year olds, GYFF is taking over the GFT for a whole weekend of films about teenage and young adult life. Look out for some great Scottish and UK premieres, and a series of panels, workshops and masterclasses offering young people interested in working in film and TV the chance to meet and work with industry professionals.